After the success of their 2014 collaboration "Bailando," Descemer Bueno and Enrique Iglesias have come together for another hit: "Subeme La Radio." The Cuban reggaeton sound of "Subeme la Radio" is a departure for Descemer Bueno, pictured here at a Spanish gala in July. In Latin America — and in the U.S., for that matter — it's been hard for a song this summer to break past Luis Fonsi and Daddy Yankee's super-hit "Despacito." But "Súbeme La Radio" — a track about how a good song takes your mind off heartache — might just give "Despacito" a run for its money. "Súbeme La Radio" is sung by Enrique Iglesias and was written by Cuban composer-turned-jazz bassist Descemer Bueno and Puerto Rican reggaeton duo Zion and Lennox. Its lyrics depict a familiar scene: turning up the radio while nursing a broken heart. And it's climbing the charts. 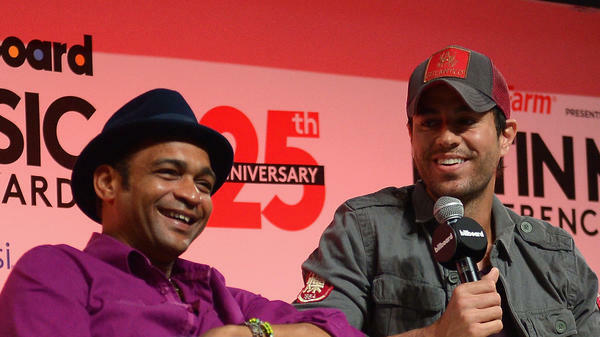 This isn't Bueno and Iglesias' first collaboration: They worked together on 2014's homage to dancing, "Bailando," with Bueno's fellow Cuban musicians Gente de Zona. The song won several Latin Grammys that year. The lyrics to "Súbeme La Radio" may be filled with heartbreak, but the song is upbeat, Bueno says from a soundcheck in Havana. He was rehearsing the hit song for a solo concert in the historic Hotel Nacional. Bueno's foray into Cuban reggaeton is a new turn for him. "I come from more romantic songwriting," explains the songwriter, now 46. He started his music career playing bass with famed Cuban troubadour Santiago Feliú, later breaking out in his own jazz bands. After stints in the U.S. and South Africa, his music turned grittier, bearing influences of everything from New York rap to Caribbean calypso and reggae. By the 2000s, Bueno was producing songs for pop stars and Hollywood movies. "He's the best songwriter right now in Cuba," says Celia Mendoza of Cuban music magazine Vistar (Bueno graced one of the magazine's first covers). "And even though he's not the best voice there is in the market, his lyrics are so good that his songs are good." 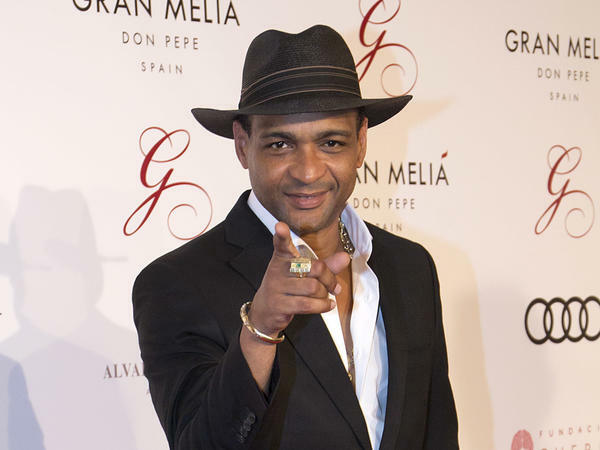 Bueno wrote "Súbeme La Radio" not expecting to solo in it, he says — but Iglesias insisted he write himself a special verse. "Huyendo del pasado en cada madrugada / No encuentro ningún modo de borrar nuestra historia," he sings. It translates to "Running from the past in the early morning / I can't find any way to erase our history." "Súbeme La Radio" captures how Bueno hopes to contribute more sensuality in his songwriting. His lyrics are more positive, he says, portraying women in a role that's fundamental to love without the exploitation and violence that sometimes shows up in pop music these days. And his approach is proving popular: The video for "Súbeme La Radio" has more than half a billion views. And, perhaps most importantly: Bueno says the song is great to dance to. In the U.S., "Despacito" is the song of the summer. We are not going to play a clip of it right now. We are going to put a different song in your head, the song of the summer in Cuba. It's called "Subeme La Radio." NPR's Carrie Kahn tells us about the songwriter behind it. CARRIE KAHN, BYLINE: First, check out the song. ENRIQUE IGLESIAS: (Singing in Spanish). KAHN: About lost love, heartache and feeling better when a good song comes on and you turn up the radio. KAHN: It's sung by Enrique Iglesias, written by Descemer Bueno with Puerto Rican reggaeton duo Zion and Lennox. This isn't Bueno's and Iglesias' first collaboration. They worked together on that 2014 homage to dancing, "Bailando," with fellow Cubans Gente de Zona, winning several Latin Grammys that year. Bueno says this newest song may be filled with heartbreak, but it's upbeat. KAHN: "That's the best part about listening to the radio," he says. "When you're depressed or hit bad times, you just crank it up and get out of your funk." We caught up with Bueno in Havana at a recent sound check. He was rehearsing the hit song for a solo concert in the historic Hotel Nacional perched above the city's bay front. KAHN: "I come from more romantic songwriting," explains Bueno, now 46. His foray into urban music, or what he says everyone on the island calls Cuban reggaeton, is a new turn in a long career. He started off playing bass with famed Cuban troubadour Santiago Feliu, later breaking out in his own jazz bands. After stints in the U.S. and South Africa, his music turned grittier, with influences of everything from New York rap to Caribbean calypso and reggae. By the 2000s, Bueno was producing songs for pop stars in Hollywood movies. CELIA MENDOZA: He is the best songwriter right now in Cuba. KAHN: Celia Mendoza works at Vistar, a Cuban music magazine. Bueno graced one of Vistar's first covers. MENDOZA: And even though he's not the best voice there is in the market, his lyrics are so good that his songs are good. KAHN: Bueno says he wrote "Subeme La Radio" not expecting to solo in it, but Enrique Iglesias insisted Bueno write himself a special verse. KAHN: "Running from the past," he sings, "in the early morning, I can't find any way to erase our history." KAHN: "I hope to contribute a more sensual way of saying things," says Bueno. He says his lyrics are more positive, with the role of women portrayed as fundamental to love without the exploitation and violence that fills much of urban music these days. He says his approach is popular, and the video of "Subeme La Radio" has more than half a billion views. And he says it's great to dance to. KAHN: Carrie Kahn, NPR News, Havana, Cuba. ZION AND LENNOX: (Singing in Spanish). Transcript provided by NPR, Copyright NPR.